Different regions may use different supply voltages and frequencies, complicating through service and requiring greater complexity of locomotive power. The limited clearances available under overhead lines may preclude efficient double-stack container service. Six of the most commonly used voltages have been selected for European and international standardisation. Some of these are independent of the contact system used, so that, for example, 750 V DC may be used with either third rail or overhead lines. Increasing availability of high-voltage semiconductors may allow the use of higher and more efficient DC voltages that heretofore have only been practical with AC. An S-series northbound train at Lawrence East station. Note the slab between the running rails. In the case of Scarborough Line 3, the third and fourth rails are outside the track and the fifth rail is an aluminum slab between the running rails. A few lines of the Paris Métro in France operate on a four-rail power scheme. The trains move on rubber tyres which roll on a pair of narrow roll ways made of steel and, in some places, of concrete. 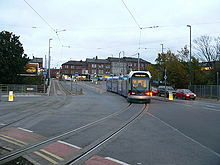 Since the tyres do not conduct the return current, the two guide bars provided outside the running 'roll ways' become, in a sense, a third and fourth rail which each provide 750 V DC, so at least electrically it is a four-rail scheme. Each wheel set of a powered bogie carries one traction motor. A side sliding (side running) contact shoe picks up the current from the vertical face of each guide bar. The return of each traction motor, as well as each wagon, is effected by one contact shoe each that slide on top of each one of the running rails. This and all other rubber-tyred metros that have a 1,435 mm (4 ft 8 1⁄2 in) standard gauge track between the roll ways operate in the same manner. Because alternating current is used with high voltages, this method of electrification is only used on overhead lines, never on third rails. Inside the locomotive, a transformer steps the voltage down for use by the traction motors and auxiliary loads. 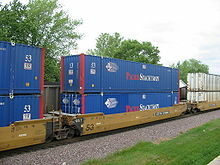 In most of the world's railway networks, the height clearance of overhead electrical lines is not sufficient for a double-stack container car or other unusually tall loads. ^ P. Leandes and S. Ostlund. "A concept for an HVDC traction system" in "International conference on main line railway electrification", Hessington, England, September 1989 (Suggests 30 kV). Glomez-Exposito A., Mauricio J.M., Maza-Ortega J.M. "VSC-based MVDC Railway Electrification System" IEEE transactions on power delivery, v.29, no.1, Feb.2014. (suggests 24 kV). ^ "[MétroPole] De la centrale électrique au rail de traction". 10 August 2004. Archived from the original on 10 August 2004. ^ Dery, Bernard. "Truck (bogie) - Visual Dictionary". www.infovisual.info. ^ Linder, C. (2002). Umstellung der Sollfrequenz im zentralen Bahnstromnetz von 16 2/3 Hz auf 16,70 Hz [Switching the frequency in train electric power supply network from 16 2/3 Hz to 16,70 Hz]. Elektrische Bahnen (in German). Oldenbourg-Industrieverlag. ISSN 0013-5437. ^ "ECO4 Technologies - Sustainable Transport Solutions". Bombardier. Retrieved 4 February 2016. ^ It turns out that the efficiency of electricity generation by a modern diesel locomotive is roughly the same as the typical U.S. fossil-fuel power plant. The heat rate of central power plants in 2012 was about 9.5k BTU/kwh per the Monthly Energy Review of the U.S. Energy Information Administration which corresponds to an efficiency of 36%. 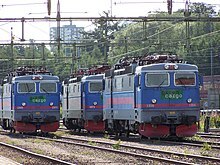 Diesel motors for locomotives have an efficiency of about 40% (see Brake specific fuel consumption, Дробинский p. 65 and Иванова p.20.). But there are reductions needed in both efficiencies needed to make a comparison. First, one must degrade the efficiency of central power plants by the transmission losses to get the electricity to the locomotive. Another correction is due to the fact that efficiency for the Russian diesel is based on the lower heat of combustion of fuel while power plants in the U.S. use the higher heat of combustion (see Heat of combustion. Still another correction is that the diesel's reported efficiency neglects the fan energy used for engine cooling radiators. See Дробинский p. 65 and Иванова p.20 (who estimates the on-board electricity generator as 96.5% efficient). The result of all the above is that modern diesel engines and central power plants are both about 33% efficient at generating electricity (in the nominal regime). ^ Wang, Ucilia (25 May 2011). "Gigaom GE to Crank Up Gas Power Plants Like Jet Engines". Gigaom.com. Retrieved 4 February 2016. ^ Railway Gazette International Oct 2014. ^ Per Railway electrification in the Soviet Union#Energy-Efficiency it was claimed that after the mid 1970s electrics used about 25% less fuel per ton-km than diesels. However, part of this savings may be due to less stopping of electrics to let opposing trains pass since diesels operated predominately on single-track lines, often with moderately heavy traffic. ^ "Committee Meeting - Royal Meteorological Society - Spring 2009" (PDF). Royal Meteorological Society (rmets.org). Retrieved 15 September 2012. ^ "Network Rail - Cable Theft". 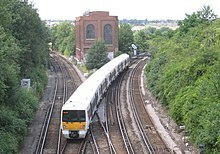 Network Rail (www.networkrail.co.uk). Retrieved 15 September 2012. ^ "Police probe cable theft death link". ITV News. 27 June 2012. Retrieved 15 September 2012. ^ Sarah Saunders (28 June 2012). "Body discovery linked to rail cables theft". ITV News. Retrieved 7 May 2014. ^ "Gefahren durch Bahnstrom, German police, 2013 -- 6 fatalities in 2012 in Bayern" (PDF) (in German). 2013. Retrieved 10 July 2017. ^ "Safety Database: UIC: Public Report: Significant Accidents 2012 Public Report" (PDF). International Union of Railways. September 2013. Retrieved 20 July 2016. ^ Nachmann, Lars. "Tiere & Pflanzen Vögel Gefährdungen Stromtod Mehr aus dieser Rubrik Vorlesen Die tödliche Gefahr". Naturschutzbund (in German). Berlin, Germany. Retrieved 20 July 2016. ^ "Ministry of Railways (Railway Board)". www.indianrailways.gov.in. ^ a b c "Start Slow With Bullet Trains". Miller-McCune. 2 May 2011. Archived from the original on 28 January 2012. Retrieved 27 February 2012. ^ a b "Cumbernauld may be on track for railway line electrification". Cumbernauld News. 14 January 2009. Retrieved 27 February 2012. ^ "Electric Idea". Bromsgrove Advertiser. 8 January 2008. Retrieved 27 February 2012.